A small full bath opens off the laundry room. It's been decorated in tub toys since we moved in! 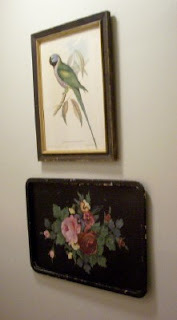 I used this cheerful parrot picture and tray to carry the tole black across the hall. Guess what my mom had in her linen closet? 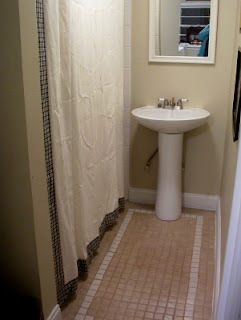 An extra-long shower curtain with black and white check border. Looks like I have a cottage bath in the works! I either need another mirror above the pedestal sink, or a small shelf where I can prop a black wire basket full of soaps. Pottery Barn has a really cool mirror with a ledge at the bottom to put bath items. I love it but can't afford it. Hobby Lobby carries a similar one for $25, but I always wait until the mirrors are on sale. Also, you could achieve the same effect by place a small shelf directly under your mirror. That would be very cottage-y and cute. I think your ideas for this bathroom are great! How fun to find the shower curtain in your mom's linen closet? I realy liked how you continued the theme into the bath room. Good eye! Your new home is just lovely!